The Catholic Truth Society (CTS) have launched a new DVD which gives an introductory presentation on Natural Fertility Awareness, suitable for marriage preparation, RCIA or young people. The DVD was created by Luton Good Counsel and it is introduced by Archbishop Kevin McDonald. Here is a direct link to the CTS page about The Joy of God's Plan. 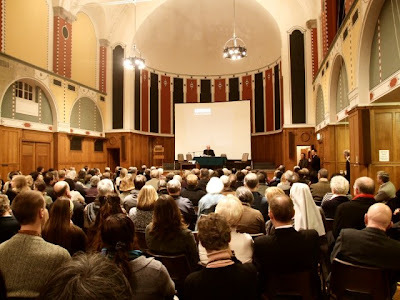 Last night saw the launch of the DVD at a packed Westminster Cathedral Hall. Archbishop McDonald introduced the presentation. Bishop Bernard Longley was also present. The CTS screened some edited highlights from the DVD and there was then a panel discussion of various questions raised by those who came to the launch. The panel included Dr Josephine Treloar of my parish who came with her husband and four older children. Last night was also a very pleasant opportunity to meet and catch up with a wonderful collection of good priests and lay people. I took the opportunity to jot down a few names - apologies to all those I have missed out. Attending were Mgr Barltrop of CASE (Catholic Agency to Support Evangelisation), Frs Anthony Doe, Philip Miller, Marcus Holden (co-author of Evangelium), Jeremy Davies, Simon Blakesley, Mark Swires, Gerry Byrne, George Roth of the Franciscans of the Immaculate, several brothers from the Franciscans of the Renewal. Among the laity, I was especially pleased to meet Nicole Parker (formerly Syed) of the Fertility Care Centre. (More about that in a minute.) There was also Daphne McLeod of Pro Ecclesia et Pontifice, Greg Clovis of Family Life International, Sir Dan of the Nesbitry (Faith Movement) and I am sure many others whom I did not even get a chance to greet. 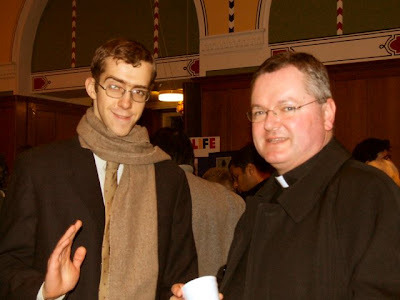 From the blogosphere, Aunty Joanna was there, as was Fr Stephen Langridge (Southwark Vocations). Below, Fr Langridge is pictured, talking to John Hayhoe-Griffiths of Miles Jesu. The evening was brought to a delightful close by the kind invitation of the Treolars to join them for dinner. 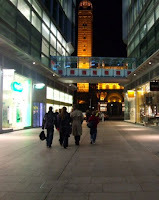 We went over to Zizzi's for pizza and pasta, just across the road from the Piazza in front of Westminster Cathedral, in the new glass and steel shopping mall. They couldn't sit all eight of us together so it was a case of haring around the restaurant, swapping places, food, and drink; and trying not to knock anything over. At the end of an evening promoting a resource to help Catholics live the Church's teaching on marriage and the family, it was very fitting to sit down to eat with such a lovely family. And the Church is young."